Sometimes talking with the baby is like speaking to a foreigner. A tiny, blonde Swede who clucks and chirps a few adorable syllables. But at the end of the day, I speak English, and he speaks baby-Swede, and this makes communication pretty difficult. One of the English phrases he has the most difficulty with is “Bum on the seat”, a command oft used to boomerang his hind parts to the chair he should be sitting in. He enjoys standing better. If he could, I think he would argue in Swedish the oxygen is better above the table rather than below it. Or maybe it’s because sitting doesn’t put to good use all the standing and walking abilities he not so long ago acquired. I suppose if I just learned a skill five months ago, I would want to use it too. Either way, my days often require attention to detail that is not part of my first – or second – nature. These details involve regularly asking myself why it is so quiet and if the quiet means something is very wrong and what do I think the Swedish baby might be standing on, balanced on only one leg. I’ve gotten better at this. I notice that about 9am there are already three Cheerios strewn on the couch cushions. Five minutes later, nine Cheerios. Baby Swedes love Cheerios. It’s hard for the baby Swede to come down from higher altitudes. I guess he likes the oxygen better up there. When I’m trying to feed myself, the baby is safest and most predictable when confined to his elevated throne of food. But the moment inevitably comes. He requests release from the throne and after scrubbing his chubby fingers free of banana slime, he is down. And running immediately. 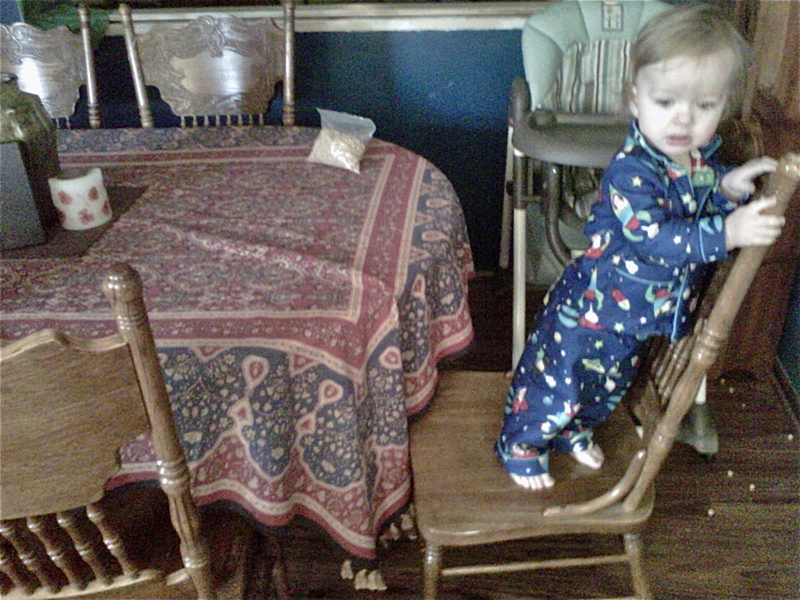 And climbing onto the kitchen chairs right after that. I pick him up, swoop his legs out in front of him and adhere that bum to the seat. There we go. No interpreter needed. We sit next to each other, me clutching my coffee and him grasping the edges of his chair. He kicks he rolly legs out toward me and his fat, little toes tap my knees. Good times with the baby Swede. Moments like this require only the universal languages of Body and Love. These ones we can both speak.